Six Komatsu Australia in-house pilots have recently received their ‘wings’ as certified drone operators, allowing for the ability to provide a total site solution, site surveying services literally miles ahead of ground-based alternatives. 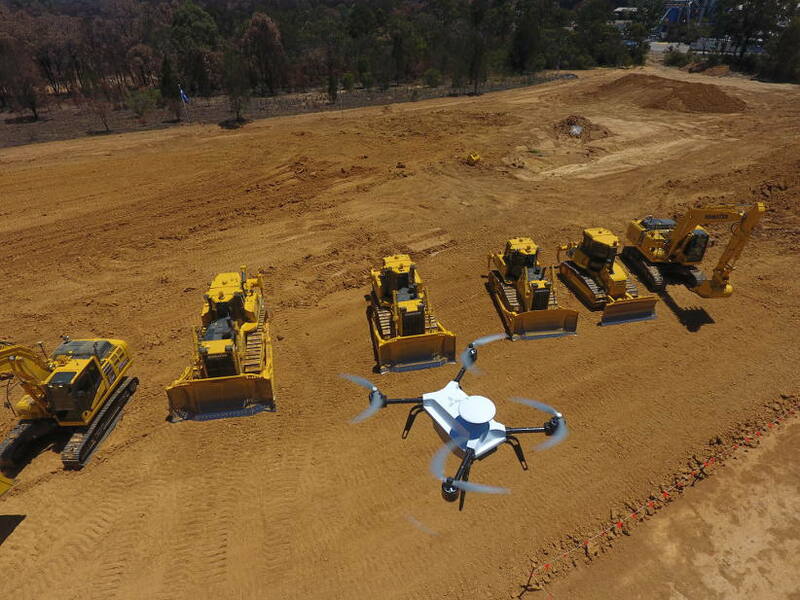 Komatsu national technology solution expert manager Aaron Marsh said obtaining the remote pilot licences was crucial for the company because it dovetails into Komatsu’s SMARTCONSTRUCTION integrated business model, providing a multitude of advantages for the initial site surveying stage and beyond. “The main advantage of aerial surveying using unmanned aerial vehicles is that it is fast and accurate and creates efficiencies in subsequent construction stages such as earthmoving,” said Mr Marsh. “For example, the 3D drone data can be fed into our Komconnect application to automatically calculate the area and volume of earth to be moved and our customers can access it in real-time. “Likewise, our factory-integrated intelligent Machine Control machines operating on the ground can update the as-built ground conditions as they go for accurate cut-and-fill volume reporting. The drone-captured data can also be used for stockpile calculations and ongoing review of construction progress and site logistics. The remote pilot certifications were obtained via Newcastle, New South Wales-based specialist training company Aviassist. Aaron said that the Komatsu pilots sat a week-long intensive unmanned aerial vehicle (UAV) course, certified by CASA, the Civil Aviation Safety Authority, which Komatsu required to fly its high-precision drones commercially. With the help of Aviassist and its professional training team, all six pilots successful completed the course. On course completion, Komatsu applied to CASA for a commercial operator’s license and during this time. “Aviassist were kind and helpful enough to help us work under their operators’ licence until we received our accreditation and have been great with ongoing advice for our company and our chief pilot if we need any guidance or assistance,” continued Mr Marsh. “Now we are fully qualified and ready to fly directly for our customers entirely as Komatsu, under our own business model which includes our own insurances”. Aviassist managing director, Ross Anderson, said he was impressed with Komatsu’s in-depth embrace of drone technology for its business offerings. “It’s great working alongside industry leaders such as Komatsu integrating drone technology into their day-to-day business. The integration between drone technology and machine control is very powerful,” Mr Anderson said.